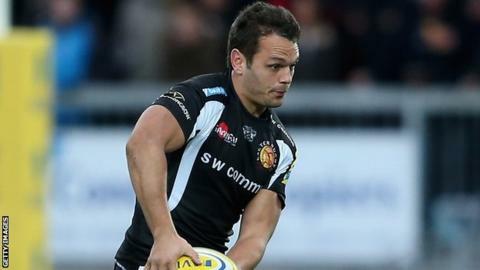 Exeter Chiefs trio Phil Dollman, Carl Rimmer and Will Chudley have signed new deals to stay at Sandy Park until the summer of 2015. Dollman, 27, who can play at centre or full-back, was head coach Rob Baxter's first signing in 2009 and has played 85 times for the club. Scrum-half Chudley and prop Rimmer joined from and respectively last summer. They are are latest players to commit to Exeter this month. "They're good guys first and foremost," head coach Rob Baxter told BBC South West Sport. "They're fully involved with what we do here as a squad and as a club. "Carl and Chudders haven't been here so long and we talked to them about coming to Exeter to prove the type of player that they are. "They've done that and as far as I'm concerned. What we've offered them is as much a reward for what they've done as it is for us as a club that we want them around. "Phil was the first player I signed completely on my own as head coach here and I look at how he's developed as a player and he's one of our core, established players here. "He's still a young guy and still improving and it was a relatively easy decision for us to want to keep him around." Dollman first joined the Chiefs in their final season in the Championship from Newport Gwent Dragons and has seen the club rise into the Premiership and onto the Heineken Cup. "I'm happy at this club, I've been here four years and I've enjoyed myself so far," Dollman said. "I'm comfortable living in Exeter and playing with a good group of lads and was always happy to put my near future here at Exeter. "I'm happy to be part of Exeter and I feel like they've helped me develop as a player. "I'm glad it's going well at the moment, but I want to be playing Heineken Cup rugby and this is a place where we can achieve that regularly and be one of those top sides in England and push on in Europe."